Facing extinction due to ubiquitous mobile phones, Britain's classic red telephone boxes are being saved from death row by ingenious conversions into all sorts of new uses. Facing extinction due to ubiquitous mobile phones, Britain’s classic red telephone boxes are being saved from death row by ingenious conversions into all sorts of new uses. “It smells nice,” a passer-by said while sniffing the waft of hot stew steaming out of one phone box in the heart of London. Every day, dozens of office workers come down to Bloomsbury Square to get their lunch at a phone box that has been converted to hold a tiny refrigerator and shelves to put the dishes on. The generous salads — the house speciality — go down particularly well with customers who like to sit in the square’s gardens to enjoy their lunch. It is one of thousands of phone boxes which are enjoying a new lease of life. 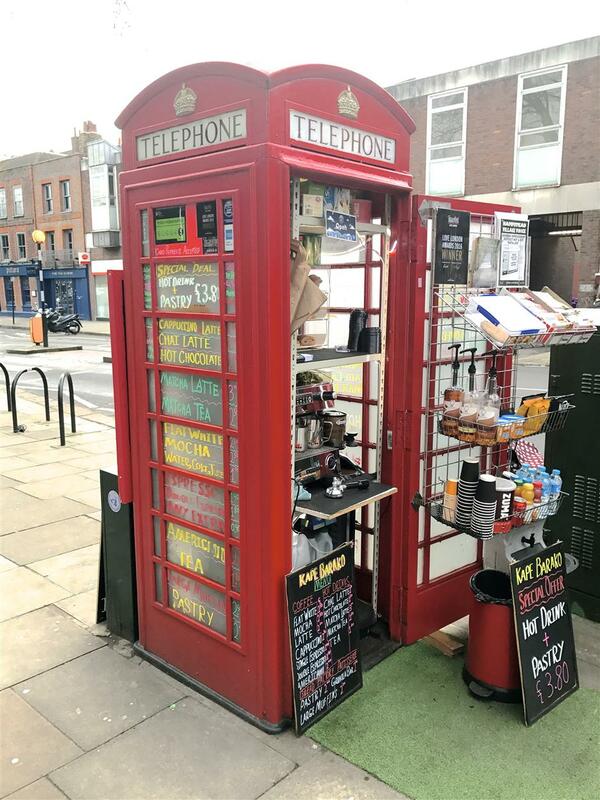 As smartphones rule the airwaves, Londoners come up with new uses for the iconic red telephone boxes as coffee shops. Often abandoned, vandalised or reeking of urine, some have been transformed into libraries, art galleries and information hubs; others into cafes, hat shops or even heart defibrillator points. Since their numbers peaked at 92,000 across Britain in 2002, phone boxes have been in rapid decline. There are now 42,000 left, of which 7,000 are the classic red booths loved by tourists. British telecoms giant BT plans to remove 20,000 more by 2022. It says most of its phone booths lose money, while maintaining them costs 5 million pounds (US$6.7 million) a year. Overall, 33,000 calls are made daily from phone boxes, a drop of 90 percent in 10 years. The best-known model is the K6, in pillar box red with a crown embossed on its curved roof. It was the first to be installed as a standard around the country. It was designed by the British architect Giles Gilbert Scott for the silver jubilee of King George V in 1935, marking 25 years of his reign. “We are looking for new alternatives to payphones,” said Mark Johnson, BT’s head of payphone operations. Several hundred phone boxes now house cash machines, while others are being turned into free and ultrafast Wi-Fi booths. BT is also considering whether they could be turned into power points for electric vehicles. Some are restored and sold via an authorized reseller, with prices starting at 12,750 pounds. Others are sold for a pound to local communities or associations wanting to give them a new lease of life, part of BT’s Adopt a Kiosk scheme which has already kept 5,000 of them standing. “The whole idea of this is keep the heritage of the UK in place,” Johnson said. 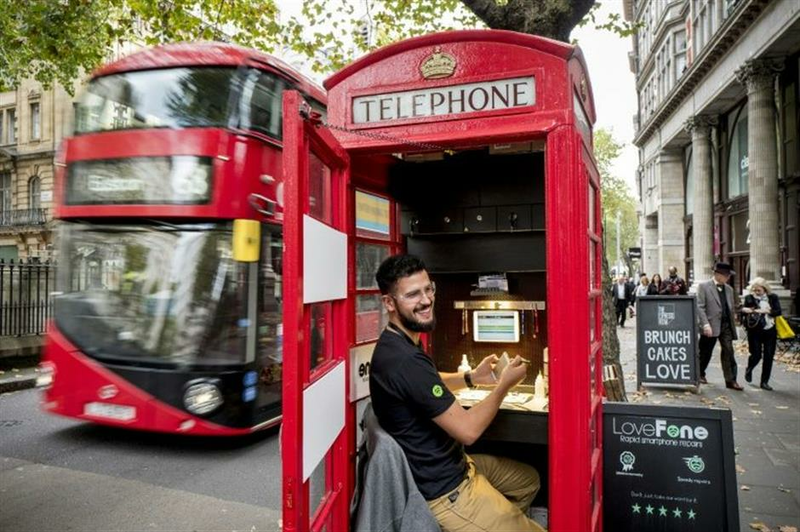 Fouad Choaibi transforms a London telephone box into Lovefone, a mobile phone repair business. The Red Kiosk Company, which donates a portion of its profits to charity, is one of the beneficiaries. It has already bought 124 redundant phone boxes, which it rents out for 360 pounds a month. It hopes to acquire 500 more over the next three years. “You’re saving an historic structure, you’re creating employment and you’re regenerating an area,” said founder Edward Ottewell. Refitting can cost up to 16,000 pounds and council approval can be difficult. But the modest rental cost allows young entrepreneurs to get started. Red Kiosk also counts Lovefone, a mobile phone repair business, among its customers. “A passer-by asked me, ‘don’t you feel claustrophobic?’” said Fouad Choaibi, sitting in his kiosk equipped with a small table, storage for spare parts and a tiny heater. “No. If it was bigger, you would have more distractions,” Choaibi said.